In May 2012, I decided to change my life with the assistance of my step-dad, David. He kept saying to me, ‘Why don’t I do things?’ Well! I had been a recluse for 4 years and had lost all self-esteem. My only contact with the outside world was my internet and phone and odd visits to the shops and seeing my parents and friends which was limited. I will show you how I did it and what kept me motivated. It has been a wonderful brilliant journey for the last 4 years. I live in Northwest London in the borough of Barnet and through my mental diagnosis of Autism was given a Freedom Pass which enables me to travel freely on the London underground, London buses, the tram and overground. What an opportunity to utilise this benefit and get out there and do some good!! My main source of motivation emanates from my love affair with the movies, especially 1980's movies such as Ghostbusters, Indiana Jones, Field of Dreams and many others. As Will Smith says, ‘I want to do good, I want the world to be better because I was here. If you're not making other people’s lives better then you’re wasting your time’. In addition to Will Smith's motivational video on YouTube and many many movie trailers it completely inspired me to do as many activities as possible in London. From May 2012 to Nov 2016 I have done activities such as volunteer work (bucket collections for Crisis homeless charity, doctors of the world, and London’s Air Ambulance), meeting Italians for language exchange (I met over 50 face to face in coffee shops in areas such as Camden or Leicester Square), tap dancing lessons, psychology experiments with University college London, language and music trial lessons of different varieties and many other activities. By the end of 2014 I had reached nearly 500, by end of 2015 - 600 and by the end of 2016 - 800 odd. The picture as seen at the top, is a design for a notebook that I did at a workshop at Paperchase in Tottenham Court Road. 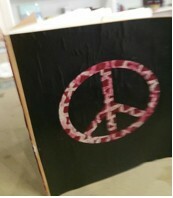 I designed the peace symbol to go on the front of the notebook. It was a great idea and got many positive reactions from the other students. This was entry: 749 in my extensive list of activities. Other examples of entries are a Catalan lesson (74), a piano quintet concert at the Royal College of Music (one of my favourite places) (102), a lecture by David Attenborough at the Science Museum (276), a tour of Highgate Cemetery (394), and watching an astounding show at the Royal Opera house, La Fille mal gardee (849). Now I am busy writing a book about the 800 odd activities in London, and have managed to negotiate the writing of the foreword in the book from a Nobel peace prize nominee that I have become friends with through peace events in Trafalgar square. I believe self-publishing is the way to go, but it’s going to take a lot of time and effort to produce this! But now in any case, all this was made possible with the wonderful freedom pass that transport for London offered me and my confidence has given rise to numerous possibilities to engage with the world like I never had before. As Will Smith mentioned before, doing good in the world is my number one priority above all else, and not just for my own personal gratification.